This Brandt Peters x Ferg Troubleboys No. 88 is probably the first western toy that I like for SDCC 2011. It's all about the Brandt Peters helmet skull. Since it's the last one in this collaboration, gonna try to pick it up. But it's gonna be hard. ONly 100 pieces sold via Lottery at the Rotofugi Booth. The first thing that hit me was an homage to the Crazy 88's from Kill Bill. It's really all about Bruce Lee anyways. Green Hornet, Game of Death. First up is the Brandt Peters x Ferg Troubleboys No. 88 [Fly] shown above. 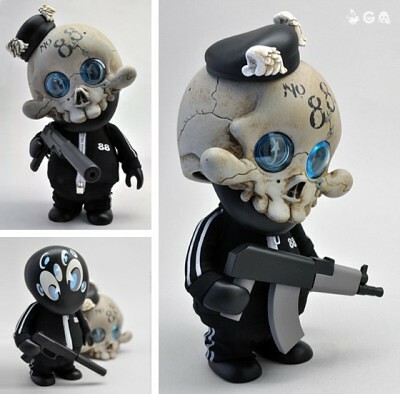 Limited to 100 pieces, this is a 6-inch vinyl and includes a track suit, silenced pistol, sAK, 2 sets of arms, 2 sets of eye lenses, a removable sKangol hat and removable helmet. It will be priced at US $110 (including tax) and will be available via lottery only. Stop by our SDCC booth (again, that's #4736) anytime Wednesday or Thursday and take a lottery ticket (one per person)...then, beginning Friday morning you'll be able to come to our booth and check to see if you've been chosen to purchase a figure, pay for it and take it.